Balearic Islands Menorca is famous for its nightlife and beautiful sea beaches. A lot of museums are worth seeing when you are in Balearic come spend your holidays on sunny beaches around Balearic Islands. Why go on holiday to Menorca? Menorca is the most family-orientated, least overrun and most low-key of the Balearic Islands. There are not only beaches to tempt the traveller but also a liberal sprinkling of reminders of its rich heritage, including beautiful buildings, charming villages and prehistoric sites. From as low as £120 for two weeks in June, self-catering accommodation with four sharing, but expect to pay around £550 per person half-board including return flights. Flights-only start from around £100. Menorca has a wetter climate and is usually a few degrees cooler than the other islands, which can be a blessing in the height of summer. May-June and September are best to avoid the crowds and higher prices of July and August. In the colder months the island is buffeted by chilling tramuntana winds. In summer temperatures average 68F (21C) - 84F (29C) and in winter they drop to 43F (6C)-58F (15C). Feeling inspired? Book a break to Spain. 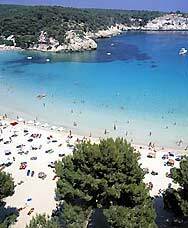 Menorca has beach resorts for all the family - some crowded for those who like it busy, some off the beaten track. You will also find beautiful scenery and coastal views as well as pretty towns and villages. There are wildlife reserves in the wetlands and many archaeological sites. Watersports are the dominant activity and you will find that many resorts have boats and sailboards for hire. There are also scuba diving centres and a couple of horseriding ranches. Golfers will enjoy the golf club at Son Parc, on the north coast near Fornells. What towns are there to visit? Mao, or Mahon, is reminiscent of a small Gibraltar - having many English influences (including the Xoriguer gin distillery), with an impressive deepwater harbour that handles fishing boats, car ferries and huge tankers. The town, which was made the capital of the island by the British in the 18th century, is built on top of the cliffs along the south of the harbour. The narrow streets of the old quarter are lovely to dally in. 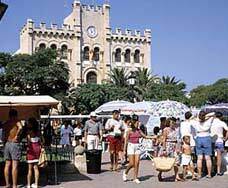 Ciutadella is an attractive and distinctly Spanish city with a picturesque port and a historic old quarter, while Fornells is a former fishing village; it's extremely picturesque but gets crowded in the season. Each town has a festival to celebrate its patron saint. The biggest is the Festa de Sant Joan, held in Ciutadella on the last weekend in June. The Festa de Mare de Deu de Gracia is in Mahon on September 8. Bronze Age stone towers (talaiots), altars (taulas) and mausoleums (navetas) in a good state of preservation are found in Menorca. Monuments litter the island dating back to 2,000BC, and most have been left undisturbed in situ, often to their detriment. Unique to Menorca are taulas - the huge stone tablets precisely placed in the shape of a T. It has been suggested that they were used for sacrificial altars but, as in the case of Stonehenge, no one really knows why these mysterious artefacts are there. The main sites are Talati de Dalt near Mahon; Rafal Rubi and Torralba d'en Salord a bit further out; and Torre d'en Gaumes, south of Alaior. Get a copy of the Archaeological Guide to Menorca from the island's tourist office in Mahon. The best beaches are on the southern coastline, which has subsequently been most developed. Fortunately the building has been restricted to smaller-scale developments in the "Moorish-Mediterranean" style - not exactly charming, but pretty enough. Drive across the lunar landscape north of Mahon to the lighthouse at Cap de Favaritx and you will find eight lovely beaches; from Binimella you can walk to the unspoiled Cala Pregonda. North of Ciutadella you'll find La Vall - a long stretch of untouched beach backing onto a private nature park. In Mao, the old town has bars and restaurants, and the waterfront road of Anden de Levante is lined with eateries with terraces overlooking the sea. Ciutadella's port is also lined with restaurants; after dinner try the Sa Clau - a hip jazz and blues bar set inside the old city walls. The resort hotels run dances and events; most resort areas are also well- stocked with bars and restaurants. Restaurants in the Balearics tend to cater for the tourist market, so you'll have no problem finding standard British and French fare. Italian restaurants are particularly popular, especially Mao. Try a meal of Spanish tapas, a selection of small dishes such as olives, albondigas (meat or fish balls), and calamar a la plancha (squid). Spanish rice dishes like paella are popular, and the seafood is mostly excellent. Grilled sardines are a local favourite. The small town of Alaior is home to the local cheese and shoe industries. Cheeses from the Quesos Coinga factory are sold all over Minorca, but there's a tasting and sales room in front of the factory. A small craft market is held in front of the church of Santa Eulalia on Saturday morning. One type of shoe is peculiar to Menorca - the sole is made of recycled car tyre. The Saturday market at Ferreries sells traditional arts and crafts, as well as fresh produce. Pottery and jewellery are also good buys. Menorca is made for kids who enjoy sea and sand. Slap the sun cream on and let them have fun. Many resort hotels have kids' facilities and clubs, which will take them off your hands for hours during the day, Check with your hotel or tour operator. The Balearic Islands are in the western Mediterranean Sea, known as Balearic. It is near to the coast of Spain. Balearic is known for its holiday destinations. The Balearic Islands are one of the Catalan-speaking territories. Majorca (Mallorca), Minorca (Menorca), Ibiza (Eivissa), and Formentera are the main islands among Balearic Islands, all popular tourist destinations in the Mediterranean Sea.